NATIONAL AWAKENING IN THE 19TH CENTURY. The 17th and 18th century saw the series of wars between Iran and Ottoman Turkey and several movements of the state borders leaving Armenian lands within the two Muslim empires. The Armenians living in barely surviving East Georgian Kingdom, in fact, were in the position similar to their brethren in Iran due to the fact that Eastern Georgia became Iranian protectorate and was regularly raided and looted by Iranian troops and irregular Turkic and Kurd tribesmen loyal to the Shahs. Having lost the last relicts of their statehood, their nobility practically wiped out, their rights not protected by the Islamic law, Armenians were emigrating en masse to Western and Eastern Europe, Russia, India, Ethiopia and later to the Americas and even such remote countries as Burma and the Philippines. Those who remained in the forefathers’ lands, vegetated under the system of millet, according to which the ecclesiastical authority over the Armenian people belonged to the Armenian Apostolic Church, to be more specific, to the Catholicos in Echmiadzin and the Patriarch in Constantinople. For more than two centuries the church remained the only factor keeping approximately 3.5 million of discriminated Turkish and Iranian subjects of Armenian background who had forgotten their history and were speaking predominantly Turkish and Kurdish dialects. 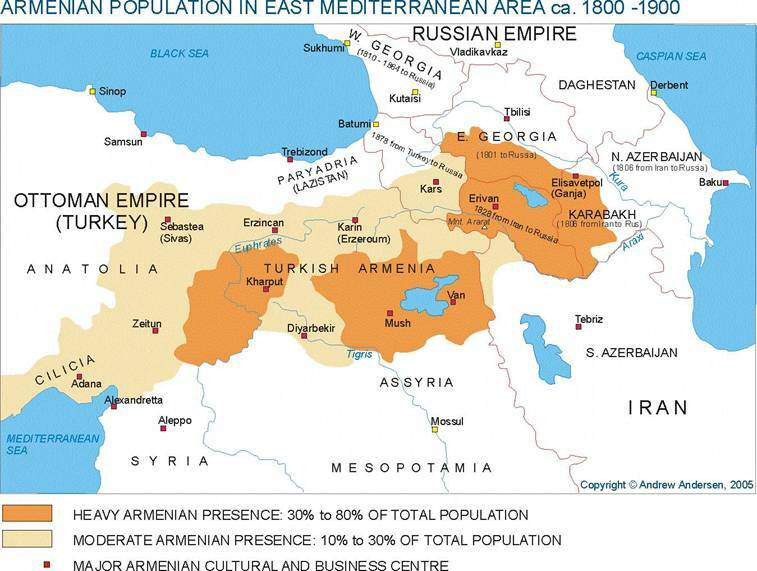 The percentage of Armenian population in both was Ottoman Turkey and Iran, was gradually decreasing due to assimilation, emigration and occasional massacre and by the year 1801 There were very few areas of historic Armenian lands where Armenians would form majority, except mountainous areas of Karabakh, Zanghezur and Vaspurakan. The beginning of the 19th century brought significant geo-political changes in Asia Minor. Expanding Russian Empire reached the Caucasus and in 1801 annexed East Georgian Kingdom. That event was followed by the series of wars against Iran and Ottoman Turkey that resulted in the incorporation of Northern areas of Iranian Azerbaijan and most of Iranian Armenia into Russia, as well as some significant territorial losses to Russia by the Turks. Armenian diasporas all over the world saw Russian expansion in the Caucasus and further in Asia Minor as a new historical chance for Armenia. In spite of the fact that Russian administration did not encourage Armenian revival in the new-acquired territories, it provided certain guarantees of physical security for Russia’s new subjects and put religious discrimination of Christians to an end. As soon as the massacres of the Armenians in the former Iranian, now Russian territories stopped, the percentage of Armenian population started steadily growing, Russian presence boosted the development of local economy and education. It also accelerated the Europeization of Armenian bourgeoisie, bureaucracy and developing middle class. According to Luc Baronyan, the above tricolor was the first Armenian “national flag” designed in 1885 in Paris by Father Ghevont Alishan. Starting with the middle of the 19th century, various Armenian organizations, predominantly the ones with centers in Europe, launched educational projects among the Armenian population of Turkish Armenia aiming at the revival of Armenian culture and forming of new Armenian patriotism and nationalism. Teaching Armenian language and history was followed by the teaching of revolutionary ideas inspired by the Great French Revolution and later by new popular theories of socialism. The awakening of Armenian nationalism resulted in the creation of secret Armenian societies, among them “Salvation Union”, “Black Cross Society”, “Armenakan” and “Protectors of the Fatherland”. Some of the above societies were behind the Armenian uprisings in Zeytun (1862), Erzerum (1863) and Van (1863) all of which were crushed by the Turks with extreme cruelty[i]. The liberation of the Balkans gave new hopes to Armenian nationalists for gaining independence through the “Bulgarian way”. However, neither major European powers, nor Russia demonstraited willingness to support Armenian independence, and a heroic attempt of a group of 125 armed St. Petersburg Armenian students under the leadership of Sargis Kukunian, to cross russo-Turkish border in order to launch the uprising in Turkish Armenia, ended up with a defeat and disaster. At the very end of the 19th century, new-formed socialist-revolutionary parties of Hnchak and Dashnak, adopted a new strategy of socialist revolution in which Christian Armenians should fight together with the poorest Muslim Turks and Kurds against the “capitalist exploiters”. That led to partial withdrawal of support of any revolutionary projects on behalf of Armenian bourgeoisie of Turkey, Russian Caucasus and Europe. of supply. 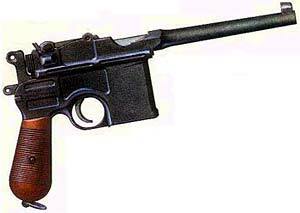 However, the lack of funds and ways to deliver the required weapons to all Armenian communities of Turkey, made the planned uprising impossible and resulted in the guerrilla movement only that was concentrating mainly in Sasun,Taron and Vaspurakan and provoked violent repressions on behalf of Turkish administration and nomadic Kurd tribes. The guerilla movement in some areas of Turkish Armenia, also known as the Fidayee movement, lasted till the beginning of the First World War and produced many experienced field commanders (Duman, VArdan, Dro, Khamzasp, Sako, Krecho, Arakel, Avo, Njde, Sepoukuh, and many others) who later became officers and generals of Armenian army during the short independence period of 1918-1920. 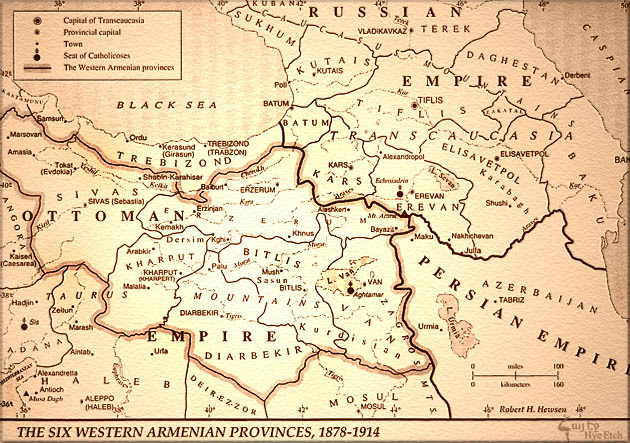 Many Fidayees of Turkish Armenia also crossed the border into Russian Caucasus during the “Armeno-Tatar War” of 1905 (violent ethnic conflict between Armenian and Azeris in Baku and other cities of the South Caucasus) to form the Mauserist self-defense militia. The Turkish-Armenian confrontation finally reached its culmination in the year of 1915 when Turkey entered the First World War. It resulted in cruel ethnic cleansing and the end of Armenian life in Western (Turkish Armenia).